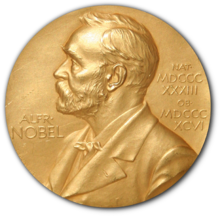 The Nobel Peace Prize is one of the five Nobel Prizes created by the Swedish industrialist, inventor, and armaments manufacturer Alfred Nobel, along with the prizes in Chemistry, Physics, Physiology or Medicine, and Literature. Since December 1901, it has been awarded annually to those who have "done the most or the best work for fraternity between nations, for the abolition or reduction of standing armies and for the holding and promotion of peace congresses". "...for his resolute efforts to bring the country’s more than 50-year-long civil war to an end, a war that has cost the lives of at least 220 000 Colombians and displaced close to six million people..."
The Nobel Peace Prize (Norwegian: Nobels fredspris) is one of the five Nobel Prizes created by the Swedish industrialist, inventor, and armaments manufacturer Alfred Nobel, along with the prizes in Chemistry, Physics, Physiology or Medicine, and Literature. Since December 1901, it has been awarded annually (with some exceptions) to those who have "done the most or the best work for fraternity between nations, for the abolition or reduction of standing armies and for the holding and promotion of peace congresses".